The countdown is on to what has become over the years my favorite holiday: Thanksgiving. I mean, how do you not love a holiday dedicated to food and family and friends and football?!?!? All you need to know is in this video from Mary Risley (Tante Marie’s Cooking School) (namely don’t stress and pour more wine!). It is on the longer side, but you definitely get the gist in the first few minutes! Also a word to the wise: if you’re listening to this at work, perhaps you want to put in your headphones. You cannot go to Hawaii and not go to a Luau. Even if you don’t like pork or BBQ or don’t eat [insert random item here]. 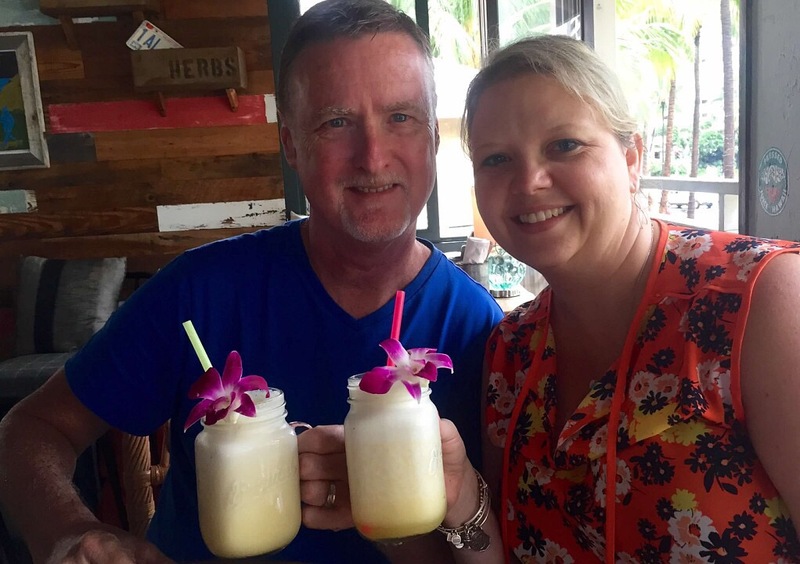 YOU’RE IN HAWAII–GO TO A LUAU! We went to the Smith’s Garden Luau on Kauai–I can’t remember exactly why we picked that one, other than the fact that the Smith Family also conveniently ran the boat tours to the Fern Grotto. It was very much a touristy place and the luau accommodated a large number of people, but it was such a fun evening: the after dinner show was entertaining, the pork was AMAZING!, and the drinks were flowing–especially the mai tais! Plus we got big chunks of pineapple in our Mai Tais….how can you go wrong with that?!?! We laughed. A lot. We got lei’d. We saw hula dancing. We learned how to hula dance (much easier after a few Mai Tais, btw!). And there was a plethora of food items from which to choose (I mean, you know how I am about food!). Also, if I didn’t already mention it–the Kalua pig was divine! I may have gone back for thirds. We were good little tourists and tried the poi–it was interesting, I’m so glad we tried it…but THE PORK! I’m drooling just thinking about it! On our last day in Kauai, we decided to take a drive–all the way around the island. Well, as far as the road would let us go (although–we did see the parts we couldn’t drive to by boat, so technically I’d say we made it completely around the island!). As usually happens in a road trip, we reached a point where we were eager to stretch our legs. Conveniently, we found a roadside drink truck advertising pineapple tea. 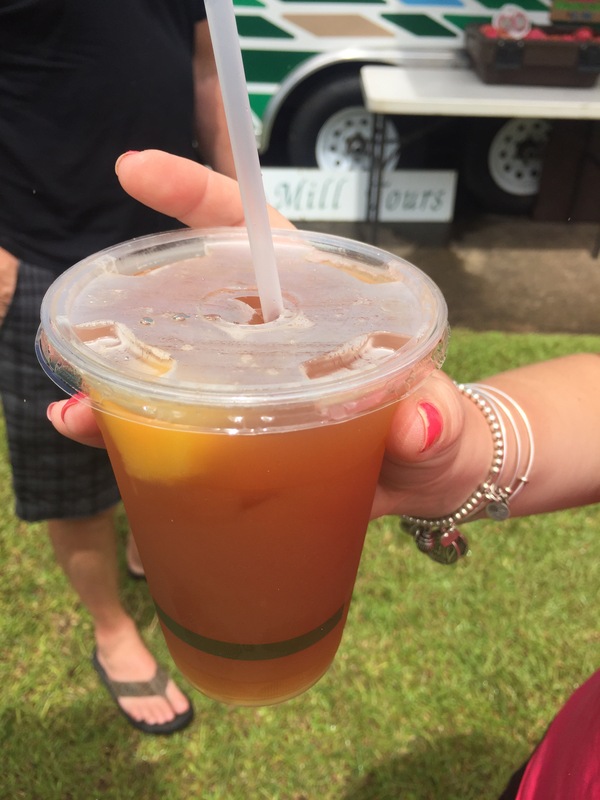 How does one say no to pineapple tea in Hawaii? One does not. It was definitely a refreshing & tasty reason to get out of the car! I know, I know: I’ve already featured the Koloa Rum Company on Thirsty Thursday before…and yes, I’m featuring them again. I mean, is there such a thing as too much rum? I think not. Here we are congregated at the tasting bar as our lovely bartender took us through all the rums that Koloa offered: White, Gold, Spiced, Dark, and Coconut. We all graciously took turns finishing April’s tastes, as she would take a small sip of each for prosperity’s sake and then would slide her glass down to each of us in turn–we couldn’t let delicious rum go to waste! After running through the line-up, we got a brief lesson on the Mai Tai and Koloa’s version for anyone who wanted one (yes, please!). Tastings are daily–but there are a limited number of slots per tasting, so the first thing you need to do when you get there (of course you’re going to go–why wouldn’t you?!?) is sign up for a tasting. After that, do take the time to walk around the picturesque grounds and visit the gift shop (just don’t miss your tasting!). For the store and tasting room hours–not to mention directions, recipes, descriptions of their current rum selections, and their e-gift shop can all be found on their website. The best part of perusing their website is that I noticed that they’ve added a new rum to their collection since we visited: coffee. Helllllllloooo gorgeous!!!! Could there be a more perfect rum for me? My only question (because the previous one was rhetorical) is: who wants to go to Kauai?!? In addition to tubing, another thing you must do in Kauai is go to Uncle’s Shave Ice and get, well, shave ice! Cool and refreshing shave ice is something that is a must-do when you’re in Hawaii (regardless of which island you visit!) and Uncle’s definitely offered up some tasty flavors. Okay, yes, it looks like a snow cone. But an awesome snow cone. An awesome snow cone that you are eating WHILE IN HAWAII. Don’t argue, just go–you’ll be thanking me half way through your first bite! Uncle’s has two locations: Lihue & Koloa. Since we were staying about a 6 minute drive from Koloa, that’s where we went..and I’d be lying if I said we only went once! We all got different flavors and then shared so we could try as many flavors as possible. We stuck to mostly flavors that reminded us of Hawaii: Blue Hawaiian, coconut, pineapple, and piña colada to name a few. It was hard to narrow down the flavors (thus multiple trips and sharing! ), but regardless of what you order–it’s going to be great! If you are thinking I’m going to talk about eggs or maybe even coffee, you would be wrong. Today I’m going to talk about pancakes. For the record, I don’t think I’ve ever met a pancake that I didn’t like. But, OMG, Hawaiian pancakes are just absofuckinglutely amazing. You might say that it’s just the scenery. And I can’t argue, the views are spectacular–and we did make it a point to visit as many restaurants with an ocean view as possible. But no, you would be wrong. What makes them so scrumptious are macadamia nuts + coconut syrup. That’s right, macadamia nuts and coconut syrup. Like these that we got on the Big Island at Island Lava Java in Kailua-Kona. The pancakes were light and fluffy and the macadamia nuts and bananas and coconut syrup just made them sing! But ever so slightly better are the Macadamia Pancakes at Eggs ‘N Things in Honolulu. The macadamia nuts are cooked into the pancakes, which make them taste even creamier. Apparently they were so good that we totally didn’t get a picture of them! But I don’t want to leave you hanging, so I went to their website and pulled this picture. I wasn’t actually planning on Margarita Monday to be a regular thing, but I figured what the heck–who doesn’t like margaritas?!?!? Btw, if you’d like a picture of your tasty margarita to appear here for Margarita Mondays, please tweet it to me @epicurioustexan or send me a message on FB! I know, I know…it’s been awhile since I’ve posted for Margarita Monday and honestly, I didn’t think I’d have a margarita post whilst posting about Hawaii. But in looking through all the pictures, I realized that we did have margaritas while we were there. And by “we,” I mean Christi and Tracy–but I had a tasty sip, or perhaps two…or maybe four. I mean how could you not when pineapple margaritas are on the menu?!? These are from the Goofy Cafe & Dine in Honolulu, where we stopped to indulge in a bit of poke, bibimbap, and corn penne before we departed for the Big Island. Goofy doesn’t have an extensive menu, but everything was fresh, delicious, and locally sourced!